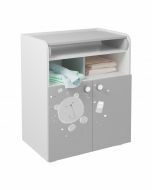 Kidsaw Kudl French 700 Teddy with drawer. 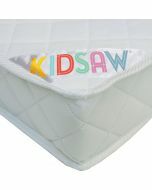 Romantic, playful and made for a lovingly decorated baby and children's room. 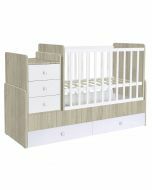 The design conjures up a fairy-tale atmosphere in your child's room. The cot has an orthopaedic slatted frame to support the optimal development of your baby and ensure a comfortable and relaxed sleep. 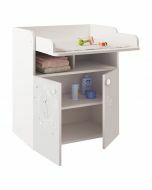 Kidsaw Kudl French 700 Teddy with drawer. 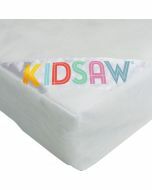 Romantic, playful and made for a lovingly decorated baby and children's room. The design conjures up a fairy-tale atmosphere in your child's room. Additional vertical slats in the side panels ensure high stability. The cot has an orthopaedic slatted frame to support the optimal development of your baby and ensure a comfortable and relaxed sleep. The surface of the bed is covered with the child-resistant and environmentally friendly paint. 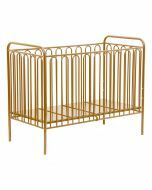 The rounded edges provide security and give the cot a modern look. Let us convince you of the high quality and the beautiful look of the bed. 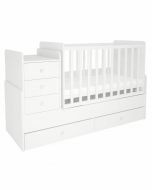 Thanks to the white colour, the cot can be harmoniously integrated into any existing furnishings. 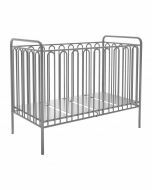 The cot complies with the European standards DIN EN 716: 1 and thus meets the demanding requirements for baby and child safety. Product dimensions: H.104 x W.123 x D.80cm.